As of May 25, 2018, organizations around the world—not just those based in the EU—need to be prepared to meet the requirements outlined within the EU General Data Protection Regulation (GDPR). Those requirements apply to any organization doing business with any of the more than 700 million EU residents, whether or not it has a physical presence in the EU. 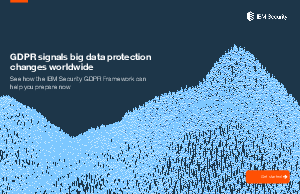 IBM® Security can help your organization secure and protect personal data with a holistic GDPR-focused Framework that includes software, services and GDPR-specific tools. With deep industry expertise, established delivery models and key insights gained from helping organizations like yours navigate complex regulatory environments, IBM is well positioned to help you assess your needs, identify your challenges and get your GDPR program up and running.